Major Plaster, discusses his books, his SOG experiences, and the importance of recognizing the heroics of SOG warriors. 1. 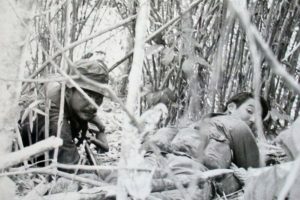 For those readers who aren’t familiar with SOG, can you explain briefly what it was and what it did during the Vietnam War? The Studies and Observations Group was the cover name for the Vietnam War’s covert special ops unit, which took over this responsibility from the CIA in 1964. SOG’s all-volunteer force included Army Special Forces, USAF Air Commandos and Navy SEALs, but direct action and recon missions were conducted almost exclusively by Special Forces Green Berets. SOG’s operators were responsible for the war’s unacknowledged top secret intelligence and direct action missions, such as cross-border ops into Laos and Cambodia and (rarely) North Vietnam, which included ambushing convoys and calling air strikes on enemy supply stockpiles, truck parks and base camps; training and deploying indigenous agents into North Vietnam, Cambodia and Laos; “black propaganda” deceptions, such as inserting counterfeit currency, boobytrapped ammo and forged documents; operating phony radio stations which claimed to be Radio Hanoi or the Voice of Liberation; running a phantom resistance movement in the North; and tracking and attempting to rescue POWs and downed pilots. 2. You were the first to write a book about SOG in 1997. Why did you decide to reveal the history of this top-secret unit, and did you have to get clearance to do so? While in SOG I served among an amazing array of courageous warriors, who gave their all without recognition. Due to its high classification and the need for deniability, these men and their achievements had not been publicized. Many of them were lost, including 300 of my fellow Green Berets, with 57 men missing in action behind enemy lines. We lost 14 teams that simply vanished in Laos or Cambodia, and another 10 that were overrun and annihilated. Having survived this, I was obliged to tell their stories when, at last, 25 years later, SOG’s secrets became declassified. Unfortunately, in 1972, when SOG disbanded, its mountain of official documents and after-action reports were purposely destroyed, making quite a challenge for my research – and for getting things declassified. The only practical approach was to track down more than 100 SOG vets, interview them at length, and combine this with the few surviving documents to write the book. How about declassification? Before I began the interviews, I contacted a special section in the Secretary of Defense’s Office which normally declassifies speeches for high-level Pentagon officials, and got an agreement that I could interview SOG vets and write the draft manuscript, provided I ran it through this office for a pre-publication screening. This procedure worked well. 3. Did you have any difficulty getting these SOG vets to share their stories and photos with you, since everything was so hush-hush for so long? Do you still get letters and photos from SOG veterans telling you about missions or exploits that have remained undocumented? As a three-tour SOG veteran, I either knew these men or had a friend in common with them. That helped a lot, both as an introduction and because I could ask well informed questions. The letter from the Secretary of Defense’s Office helped, too, because it put me on the hook to make sure that whatever they told me was properly vetted. But at another level – and this was really important – because I’d been on the ground myself, they opened up at a personal, human level that they might not have shared with an outsider. Some reviewers have applauded the book’s grittiness and reality – the direct result of these men sharing the unvarnished truth with me, which I strived to achieve in the book. Almost every week, even ten years after its initial publication, I’m still contacted by SOG vets either to recall some mission or a lost friend – we will never forget, but thanks to this book (and to several others that followed), we can go to our graves knowing that history will not forget who these men were, or what they achieved. 4. Some readers may be wondering what is the difference between SOG: The Secret Wars of America’s Commandos in Vietnam and SOG: A Photo History of the Secret War. Can you explain how the books differ? When my first SOG volume was published in 1997, virtually no one – even Vietnam vets – had ever heard of SOG. It was a close-hold organization, operating behind a veil of secrecy. SOG vets were an extremely security conscious band of men. Then, with the publication of my first volume -- this book -- it was clear that SOG and its many operations had been declassified. Many more SOG vets popped up, and, it turned out, almost each one had violated security just a little bit, to save one significant photograph. After quite a number of men offered to loan me their most valued photos, I realized that a follow-on, photographic history was possible. So, I spent another three years collecting more than 2000 images, culling them down to the 700 that could best tell SOG’s story, and wrote a new narrative to go with it. These really became companion volumes, because the men, the weapons, the aircraft, the tactics of the first book, were thoroughly illustrated in the second one. One reviewer noted that the photo history was probably the most thorough treatment ever published on an American military unit because it so well explained its operations, its heroes and its hardware. 5. We know that you served three tours in SOG. How did you hear of SOG, and what made you volunteer? While I was going through Special Forces training at Ft. Bragg, North Carolina, SOG was a phantom – we trainees heard that name whispered but never an explanation of what it was or what it did. We realized that this was somehow very secret, and that this unit (if it was a unit), performed extraordinary things. Well, those of us who volunteered to join the Army and volunteered for the Green Berets at the height of the Vietnam War were not exactly draft evaders – we were action-minded, and SOG, it seemed, was the most active of special ops forces. Yet, no one knew where or how to join SOG. It was only after I arrived in Vietnam, assigned to the 5th Special Forces Group, that a friend from my training days approached me and suggested I volunteer for “CCN” – no explanation, just those three letters. I did, and only after I was aboard did I learn that CCN and CCC and CCS were cover names for one of SOG’s action arms, and that these men were only assigned on paper to the 5th Group. In reality, we worked directly for SOG, and SOG worked directly for the Joint Chiefs of Staff in the Pentagon. 6. SOG veterans were awarded 11 Medals of Honor and hundreds of Purple Hearts, as well as many other medals, and there are many wonderful stories of bravery in this book. Can you tell us one or two of your favorites? One of my great privileges in writing this book was to tell the story of Bob Howard, the finest, most courageous warrior I’ve ever known. He was a tremendous inspiration to all of the younger Green Berets, and just about everyone. Howard was recommended for the Medal of Honor three times – and finally awarded that pale blue ribbon for the third incident. He also has EIGHT Purple Hearts for wounds, including several major gunshot wounds. Almost no one had ever heard of him before this book, but now he has become very well known and recognized as the most highly decorated veteran not just of Vietnam, but in the entire history of the U.S. Armed Forces. I made a special effort to tell the story of all of SOG’s Medal of Honor recipients, including Roy Benevidez, who suffered 27 wounds while rescuing a surrounded SOG recon team in Cambodia; Fred Zabitosky, who pulled a badly wounded Huey pilot out of his crashed chopper despite his own broken back and severe burns; Loren Hagen, who posthumously received the war’s final Army Medal of Honor, and fought the most lopsided fight in U.S. military history – his team was outnumbered 107-to-1, a ratio seven times worse than the Alamo. They’re all here, along with a great many other amazing stories of amazing warriors. Speaking of honors, you were inducted into the Special Forces Hall of Fame. Tell us what it meant to you to be recognized for your contributions as an SF soldier and supporter after you retired from the military? It was quite a surprise when I received a call from the John F. Kennedy Special Warfare Center, announcing that I had been selected as the 22nd Green Beret to be inducted into the Special Forces Hall of Fame. As I said at that time, and when I attended the ceremony at Ft. Bragg, I accepted this great honor as a representative of all SOG’s warriors. From time to time, I’ve met young men in Special Forces who tell me the reason they joined was because they’d read one of my books – that always sends a chill down my spine, and makes all my efforts worthwhile. But I’m not alone. I don’t know a single SOG or Special Forces veteran who does not support today’s Green Berets and Rangers and SEALs and respect what they’re doing fighting today’s wars. Our hearts are with them. 8. I know that you were very honored to have General John Singlaub write the foreword to this new edition of your book. Tell the readers why General Singlaub is so uniquely qualified to introduce this book about SOG. General Singlaub is not only a former Chief SOG (the title for SOG’s commander), but a veteran of highly classified special operations going all the way back to World War Two. During that war he was an officer with the OSS – the Office of Strategic Services – and led a Jedburgh team that parachuted into Nazi-occupied France to work with the French Resistance. After the war he was loaned to the newly created CIA to serve in Shanghai during the Chinese communist revolution. During the Korean War he served with JACK – the CIA-controlled special ops unit running missions into North Korean and China. He was in the forefront of freefall parachuting in the 1950s, and a founder of what became the U.S. Parachute Association. And, of course, he was Chief SOG, 1966-68, and known for being a human dynamo and hands-on leader. In the 1980s, he was a great supporter of the Nicaraguan Resistance who fought the Sandinistas. There’s probably not another living American who has as much experience in the field of special operations. I have nothing but the greatest respect for General Singlaub. In addition to your three SOG books, you are also the author of Ultimate Sniper, The History of Sniping and Sharpshooting, Sharpshooting in the Civil War, and Sniping in the Trenches (WWI sniping) as well as three Ultimate Sniper videos. What projects are you working on now? I’m always working on something – keep in mind that my sniping history book began with a bit of research in 1983, and eventually became 16 crates of documents and a huge book. Because of personal experiences at special operations and sniping, and my unending research on these subjects, I’d like to start writing novels that put these subjects together with interesting historical characters. Some publishers tell me it’s not a great market for novels today because so many younger men spend their time watching sports on TV or surfing the Internet, or playing video games. But I think a well-written story, with dynamic characters and a fresh plot – well, I’m going to give it a shot. My firearms-related research continues, too, and I’m always tinkering with some new invention. My latest is a rifle support that attaches to a belt and dramatically steadies your rifle to improve accuracy. Currently I’m also a consultant to several manufacturers in the firearms industry, advising them on their riflescopes, lasers and spotting scopes – and I hope to have a role in some new products, too.